VinThin® is the first all-natural one-per-day weight loss supplement that has been proven effective in randomized double-blind placebo-controlled clinical trials. In those trials, participants lost an average of 9.1 lbs in 8 weeks without any special diet or exercise. Of course, combined with diet and exercise, you can lose weight even faster. 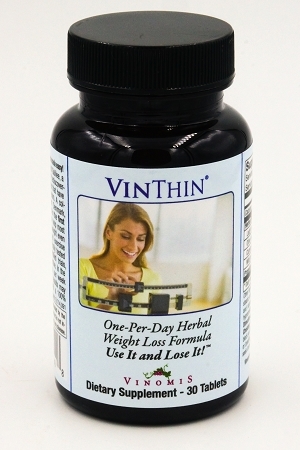 VinThin helps reset your body's appetite control so that you feel full faster and longer. It also helps boost metabolism, and block the production of fat and cholesterol. At the Al-Maissam Research Center, near the Sea of Galilee, a renewal of ancient medicinal wisdom is under way. It is a unique collaboration of farmers, scientists, pharmacologists and herbalists. Their goal is to revive the rich heritage of Greek-Arabic herbal knowledge that has been passed down through generations of healers. Several years ago, they recreated an herbal blend that can help people lose weight. It curbs appetite, speeds digestion, and helps improve metabolism. Scientists in Copenhagen, Denmark combined the blend with a Japanese dietary fiber to create a patented one-per-day formula. Alchemilla vulgaris L. (Lady’s Mantle extract) has been traditionally used to suppress appetite. The tannins in the leaf make the body react as if it was cold. This triggers it to produce heat by burning up stores of fat. Other chemicals in the leaf may slow the enzyme that breaks down food, making the stomach feel full for longer. Olea europaea L. (Olive Leaf extract) makes less sugar pass from the food in the stomach into the blood stream. Experiments also show that it can help reduce blood pressure at the same time. Because excess weight is often associated with high blood pressure, the supplement has this added health benefit. Arabic herbal texts also mention its use to help control blood sugar. Bitter chemicals in the leaf also help break down fats. Cuminum cyminum L. (Cumin Seed extract) is currently used throughout the world to treat stomach complaints and to ease digestion. More efficient digestion shortens the time between eating and the body signaling the brain that it has sufficient nutrients, which reduces appetite. Mentha longiforia L. (Wild Mint extract) has been used throughout Europe and the Arabic world for centuries as a way of calming the stomach and aiding digestion. This increases the efficiency of digestion, reduces appetite and complements the action of the Cumin. There is also research that shows that mint can dramatically reduce fat and cholesterol production in the liver. Propolmannan, a highly purified extract from the tubers of Amorphophallus Japonica. Dried to a fine powder, it has the highest molecular weight of any natural substance in the world – over 2,000,000! It has an extraordinary ability to absorb fats and carbohydrates and help block their digestion. Its primary purpose in VinThin is to form a time release matrix with the other ingredients, allowing the one-per-day dosage. Studies have shown that multiple doses per day precisely timed before meals are very difficult to sustain, and most people do not, which negates any effectiveness of those supplements. 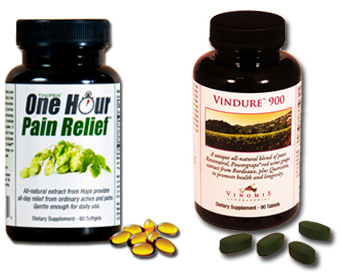 The FDA does not review or approve any dietary supplements. VinThin is not a drug, and is not intended to diagnose, prevent, or cure any disease. Can I take more than one per day for additional weight loss? The time release agent will make you feel full for up to 12 hours, and there would be no reason to take additional VinThin unless you feel hungry sooner. What is the best time to take it? At least 20 minutes before your first meal of the day is ideal, but you can take it at any time. If you take it at night, you will not get the full benefit, as the time release works for up to 12 hours. Are there any drug interactions? Please check with your physician if you are taking any prescription medications, particularly blood thinners. Are there any allergens in VinThin? VinThin has no common allergens including Soy, Wheat, Peanuts, Tree Nuts, Shellfish, or Gluten. How fast will I lose weight? In the clinical trials, participants lost an average of over 9 lbs. in the first 8 weeks. In informal studies, those participants continued to lose over 1 lb. per week. The weight loss is proportional to excess body weight, so the weight loss will slow down as you get closer to your normal weight. In the trials, participants were NOT asked to go on any special diet or exercise program. If you do exercise, your weight loss may be faster. Are there any stimulants in Vindure? There is no caffeine or any other stimulant. The herbs in VinThin do help increase metabolism. Some people may feel slightly chilly. This can be a combination of the tannins in the Lady's Mantle tricking the body into thinking it's cold, and as you lose weight, you have less insulating body fat. Are sample packs available like other Vinomis products? Sorry, we are not offering sample packs. You really need to try VinThin for at least 30 days to see if it's for you. Our products are unconditionally guaranteed and may be returned for any reason for 60 days from the original shipping date. We will refund the full price and any shipping you paid us for products that are returned to us during that time, including one open bottle. Please call customer service for an authorization number prior to sending back product so that we can process refunds without delay. Refunds will be made back to the credit card, bank account, PayPal account, or Amazon account that was used for the purchase. Please note that shipping is not refundable on free sample packs. Customers are responsible for the return shipping and postage. We suggest that returns are sent using tracking. Vinomis is not responsible for lost return shipments. Return postage is the customer’s responsibility, and is non-refundable. We are not responsible for lost or damaged returns, and recommend that you use a traceable carrier that can provide delivery confirmation and insurance for your protection. Please include the return authorization number provided by our customer service representative to ensure a speedy refund. Copyright© 2009-2018 Vinomis Laboratories. All Rights Reserved.